R&R are one of the leading suppliers of aerosol filling machines and are a business which specialise in aerosol can filling equipment. 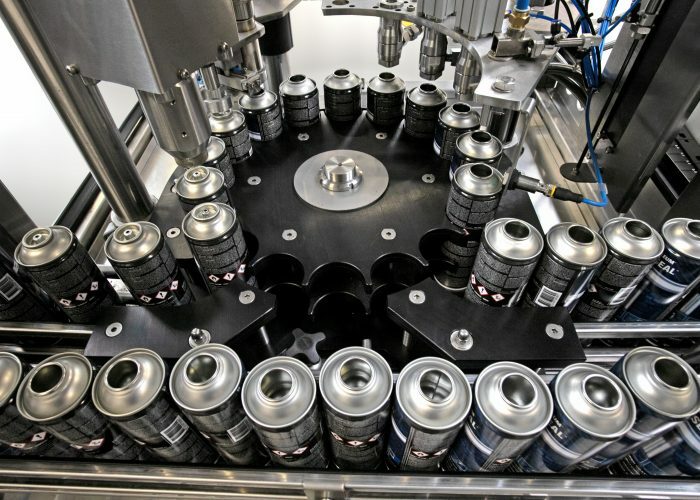 Our aerosol can filling machines come in either In-Line Indexing, or Rotary Indexing configurations, depending on the application that the automatic aerosol filling machine will be used for. 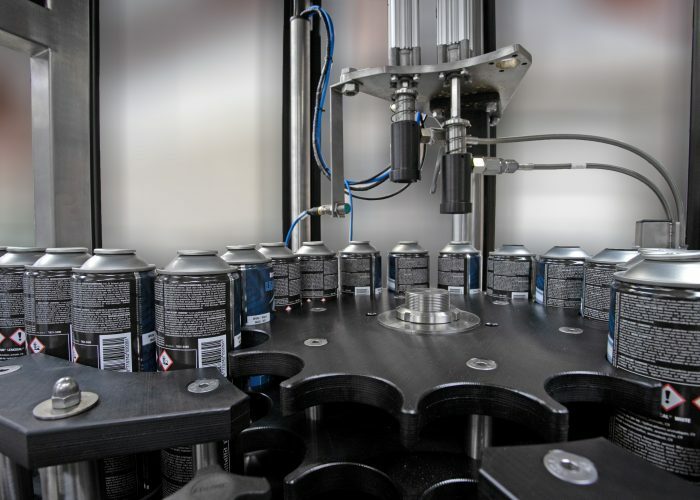 The Machines can index single or multiple aerosol containers per cycle, making them effective filling systems. Stainless steel machine framework and upper guarding supports. Stainless steel lower guard plates. Stainless steel access doors and viewing panels with shatterproof infills. Quick-change anti-static container guides to accommodate multiple aerosol container diameters and/or types (typically one set supplied per Machine, additional sets available for purchase). Manual height adjustment mechanisms to accommodate multiple aerosol container heights (within a typical range). As an option, height adjustment can be motorised and automated via the PLC Control System using a menu-driven selection system. Safety circuit with emergency stop and door monitoring. An option is available to automatically lock the access doors while the Machine is operating. “No Can No Operation” container monitoring and tracking through the Machine. Queue Control Sensors on Infeed and Outfeed of the transport conveyor to ensure proper operation of the Machine. 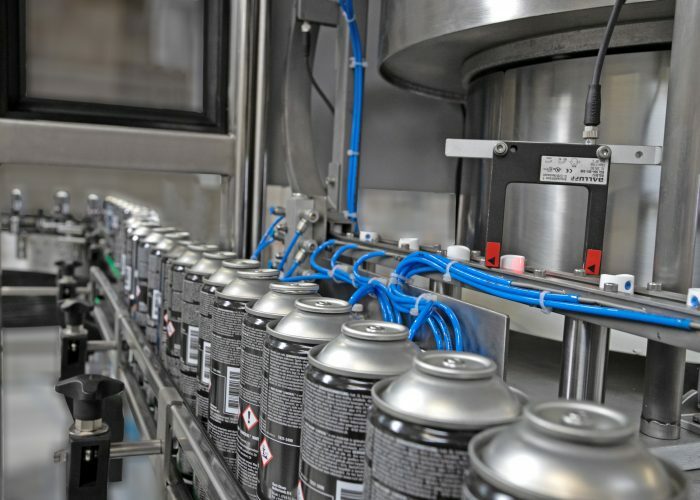 Our aerosol/spray paint can filling machines and other products are CE marked and issued with a Declaration of Conformity to BS EN ISO/IEC 17050-1:2010. Our bag on valve aerosol filling machines contain technology which improves your aerosol products by making them more user-friendly and ensuring there is an even distribution of spray up to a rate of 99% emptying. There are further useful benefits of our machines. For example, the ball bearing dropper (sometimes known as ball bearing placers) adds a small marble into the aerosol can which helps with agitation of the product when it is used by the consumer. 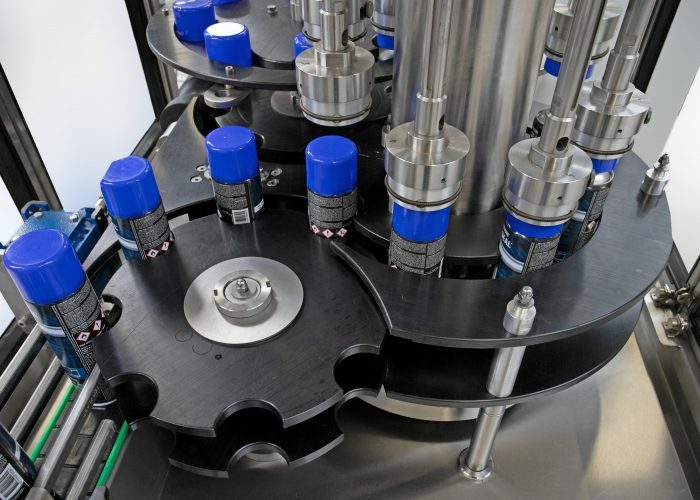 To find out more information about our aerosol filling equipment, please browse our related pages for further details or contact us to discuss your requirements. Propellant Filling – One or more propellant heads configured to the liquid propellant (such as LPG) characteristics, connected to propellant pumps with adjustable volume delivery.